Jimmy Kuehnle spoke at SculptureX. He is a Cleveland-based artist known for his interactive inflatables, site-specific installations and public performances. SculptureX is a teaching and networking resource aimed at promoting collaboration among art teaching institutions within the region and to increase appreciation of visual arts programs of sculpture in its broadest meaning. Operating under the nexus of the Sculpture Center in Cleveland, the fundamental goal of SculptureX is to encourage and foster the intellectual pursuit of compassionate thinking, while discovering new forms and definitions of visual communication and understanding. This year's symposium and its associated exhibitions explored Social Practice, which has long been a powerful means of challenging existing norms and conditions. Often expressed through community engagement, performative installations, political encounters and environmental activities, Social Practice in art is sometimes ephemeral, often experiential, but always evolving. 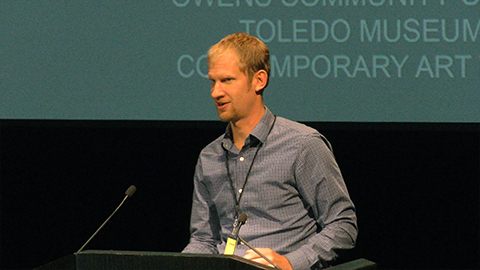 This year’s symposium was hosted by: Bowling Green State University, Contemporary Art Toledo, Owens Community College, Toledo Museum of Art, and the University of Toledo. Support for Knowledge Stream is provided, in part, by a generous gift from The Appold Family Charitable Trust. The State of the Church, 2011 Richard Gaillardetz Dr.